We urgently need to monitor changes in breeding Woodcock numbers, given the recent population decline. Please do consider re-surveying your square or another site in 2019 and help us monitor this declining species. Please register or login using the buttons on the left to request a square or submit your 2018 counts. 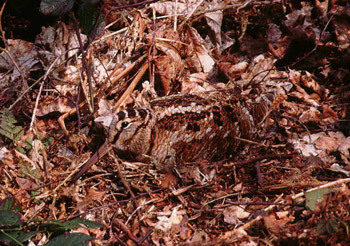 Full results have been published for the 2013 breeding Woodcock survey (PDF), which estimated a population of 55,241 males, representing a decline of 29% since 2003. Summary details can be found on the Results page. Woodcock is the only species of wading bird in Britain and Ireland that is adapted to breed in woodland, both broad-leaved and coniferous. Its plumage is superbly camouflaged to blend in with dead leaf litter and ground vegetation, where it may roost or make its nest; remaining motionless unless approached at very close quarters.
. In 2015, it was upgraded to Red listed (previously Amber listed) as a bird of conservation concern, due to the decline in breeding numbers and range. has been devised, which uses the counts of the territorial roding flights, undertaken by males at dusk and dawn, to estimate the number of individual males present. estimated a breeding population of 78,000 males in Britain. Thus providing a baseline against which to assess future population change. During winter, it is estimated that up to 1.5 million individuals may be present in Britain and Ireland; mostly originating from northern Europe and western Russia. The results of the annual breeding season counts run by BTO and GWCT, will be crucial for monitoring future changes to the breeding population. Contact survey organiser Greg Conway (woodcock [at] bto.org) if you have unanswered questions about survey methods or recording forms.